TL;DR: Mailgun webhooks allow you receive event data for your transactional emails and they are easy to work with. You can use the data to build custom analytics and enrich your applications. For a real world example, check out Suet on Github. Transactional emails are essentials for most apps. We send welcome emails, password recovery emails, notifications and more. And when we do, we use providers like Mailgun. Sending the emails is cool and all but what about the delivery and performance? Did that user get that password reset email? Was that ‘credit card expiring’ notification email opened? Although this data is available in your Mailgun account dashboard, another way you can also get updates about what’s happening to your transactional mails in Mailgun is through webhooks. There is also the API but unlike with the API where you “request” for these updates (Poll), with webhooks, the updates are sent to you (Push). All you need to do is provide the URL of a script that can handle the event data through POST . Needless to mention, push has some advantage over poll. You don’t have to make repeated API requests. This means consuming lesser server resources. Updates are more realtime because it is pushed as soon as available on the server. There are two ways to set up webhooks in Mailgun. It can either be done through the Mailgun dashboard or API. The more straightforward way to do it is through the dashboard. Once logged into your dashboard, a Webhooks link is available on the navigation bar. The webhooks page lists the different event types you can receive event data for. By clicking the + button in front of each event, you can set the URL the event data will be sent to. To handle the event data sent to our webhook URL, we must know what the data look like in the first place. Parameters sent via POST is available in the API documentation. We can go a step further and confirm this by using a test webhook URL that will log the data from Mailgun. We can use Mailgun’s Postbin or requestb.in. These services will generate a unique endpoint we can use in the Mailgun dashboard to get sample event data. I recommend requestbin because it provides more details like the request headers. These headers are important because you will easily miss the fact that Mailgun sends some data using the content-type application/x-www-form-urlencoded and some as multipart/form-data. Missing this little detail changes everything about how you get the event data. Let’s go ahead to create a test endpoint and see what the event data look like compared to what is in the documentation. Visit requestb.in and create a bin. 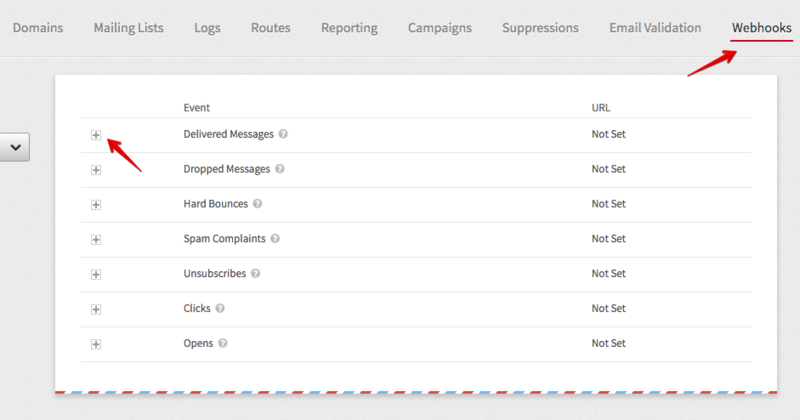 Copy the URL and access the Webhooks section of your Mailgun dashboard. Paste the URL in the input field and click the Test Webhook link. This will send sample event data to the URL. Repeat this for all the events you are interested in. Refresh your requestbin page to see the event data sent. If you look closely at the requestbin data, you will notice what I said about some data being sent as multipart/form-data. Concatenate the values of timestamp and token. Encode the resulting string with HMAC, using your Mailgun API key as the key and Sha256 as the algorithm. The result should be the same as the signature. For every request, check against a token cache to prevent use of the same token. Every token will be stored there. This will prevent replay attacks. Check if the timestamp is not too far from the current time. If you send lots of emails and you are expecting lots of events, putting your webhook script on a server that can’t scale automatically is a bad idea. Even if you are not expecting lots of events, unexpected things can lead to a surge in events. Having a server that can scale automatically is really useful for instances like this. Enter Serverless computing. In simple terms, the idea is that you can delegate the execution of your code and everything related to a provider. Because multiple instances of your code can be executed in parallel and you can adjust computing resources like RAM and execution time on the fly, it is highly scalable. You are also charged based on consumed resources and execution time so it can be really cheap. There are a couple of serverless computing providers. One I use and recommend is Google Cloud Functions because of the ease of setting up HTTP functions. An HTTP function is a code block wrapped as a function that can be triggered by visiting a URL. This is exactly what we need as our webhook. Based on the request content-type, the body of the request is automatically passed and available in the body parameter of the request object. This doesn’t work for the content type multipart/form-data though. And as we already know, Mailgun sends some data as multipart/form-data. We can bring in a library like Multer by using require(). However, we need to ensure the dependency is listed in the package.json file. Next, we can publish the function to Cloud Functions. An easy way to do this is to do it from the Cloud Functions dashboard. Go to your Google Cloud Console (if you don’t have an account yet, create one). Enable Cloud Functions in the dashboard. Enter a name for your function (e.g mailgun-webhook). In the trigger section, select HTTP trigger. Note the URL, that will be your webhook URL. Copy your event data handling code to the index.js section of the Cloud function. Copy the content of your package.json and paste in the package.json section. Select or create a Stage bucket. The stage bucket is simply where the code is staged. You can use anything here. In Function to execute, enter the name of your function (e.g webhook). You can now use the function’s URL in Mailgun as your webhook URL. Working with Mailgun’s webhooks is easy. There are many ways the event data can be used to enrich your applications outside Mailgun. If for example you allow your users send emails from your web for any reason and you use Mailgun, you can use this to provide analytics for them. Or maybe you want to send your email analytics to another platform. Or maybe you want to be notified of failures in your Slack account. Or maybe not even that. Maybe you just want more detailed analytics than what is available on the Mailgun dashboard. Whatever the use case is, the event data is available for you. For a real world example, check out the source of Suet’s webhook file.